On Sunday, April 5, 2009 over 1,000 people took part in the first Walk Your History, where they learned about the fascinating history of Belvedere and Tiburon by walking three loops on the Peninsula. Over 100 volunteers and Living History docents brought history to life. Participants ran into historic figures like the notorious bootlegger Sam Vella in front of Sam's Anchor Café and the stationmaster at the Donahue Depot who lived above the building with his family. This free event was sponsored in part by a generous contribution by the Tiburon Peninsula Foundation. The second Walk Your History will take place in Spring 2011, so get your walking shoes ready! The Belvedere Loop included historic paths and lanes that crisscross the island and historic buildings like the Casino, the Blanding House, Hill Crest, and the Tuckey House. The Lagoon Loop included historic Richardson Bay Cod Fishery, Hilarita/Net Depot, and Reed Dairy. The Downtown Loop included China Cabin, Ark Row, Main Street and the Railroad and Ferry Museum. This free event was led by the fantastic steering committee of George Rodericks (Belvedere City Manager), Leslie Doyle (Landmarks Director), Cathleen Andreucci (Belvedere-Tiburon Recreation), Dana Thor (Belvedere-Tiburon Recreation), Petey Stein (Tiburon Peninsula Foundation), and Diana Bradley (Poster Artist). 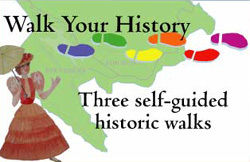 Walk Your History was sponsored by the City of Belvedere, Town of Tiburon, Tiburon Peninsula Foundation, Belvedere Community Foundation, Belvedere-Tiburon Landmarks Society, and Belvedere-Tiburon Recreation.